Since my computer doesn't have Minesweeper (only on VirtualBox), I decided to make my own. Controls are explained in the "How to play" spoiler below and during the gameplay. Also fixed some bugs and rewrote the victory system. Now a valid win is when all non-mine tiles are exposed. The game automatically generates a map with randomly placed mines (probably in some patterns, didn't notice any). The goal is to flag all mines without blowing them up. The counter in the top right corner shows how many mines left. 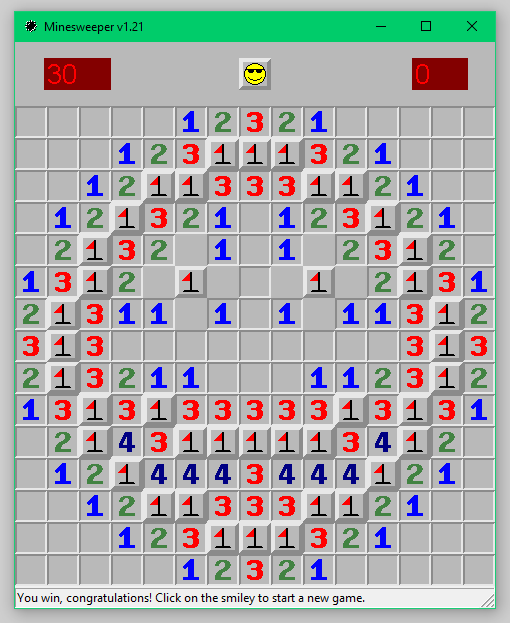 Non-mine tiles show the number of mines that surround the tile (up to 8 mines). Map is generated when you start a new game and click on a tile, making sure it doesn't make any mines around your cursor (but sometimes it does happen). If you use an Xbox controller, use the left joystick to navigate the cursor, A to left-click and Y to right-click. Press R (or B on Xbox) to restart the game and go back to main menu. When you win, click on the smiley with sunglasses to start a new game. When you open Level Editor, you will encounter a small menu. Here you define your custom map size or load an existing level. Click "Create" to start a new level. You can place two types of blocks: Flags and walls. Walls don't do anything and can't be revealed. Flags are the positions where the mines will be. Once you're done, hold Ctrl+S (or RT on Xbox) to save the level. 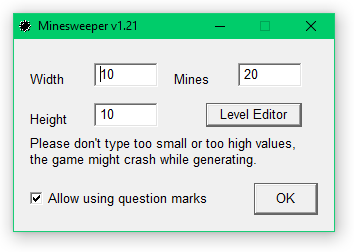 Levels are saved as *.mns and can be opened directly with Minesweeper without having to start the game first. The old one which calculates the chance of a mine, and a new, much faster one, which spawns the mine at a random location. Did some optimizations and the game can now handle even bigger maps. I managed to play on a 600×300 map with 40.000 mines, but it was responding very slowly. Speaking of generating mines, I added a counter which shows the generating progress. 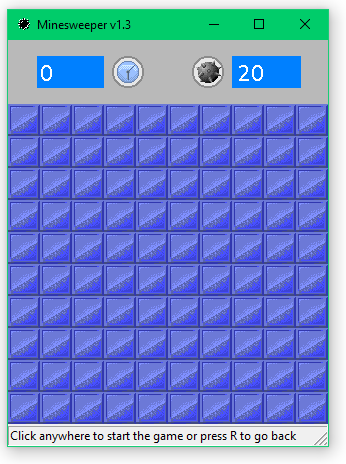 When you click on an empty tile in original Minesweeper, it exposes all empty tiles in the area. This Minesweeper has now an option to do that too. Version 1.3 had some bugs that appeared due to the new texture pack. The new walls didn't do their purpose - they were clickable and revealed numbers. I took care of that. Fixed new flags' behaviour in editor. Scanned mines are now rendered on the graphics layer so they don't overlap the scanner. Had a little problem with checking whether the player flagged the correct mines, but I managed to fix it. New texture pack! 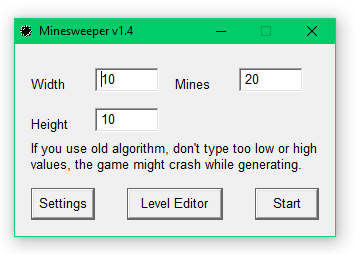 Enjoy Minesweeper like it was on Windows Vista/7! This texture pack also contains death and win animations (and the original sounds, of course). Also fixed some graphic bugs and made the mine count display as big as the time display (to make it symmetrical). Due to the huge amount of additions, the game size has raisen up a bit, even though I tried to make it smaller. Everytime you restarted a game, the window moved more to the right, which was a bit annoying. This doesn't happen now. If your timer goes over 1000, it will no longer get out of the rectangle. 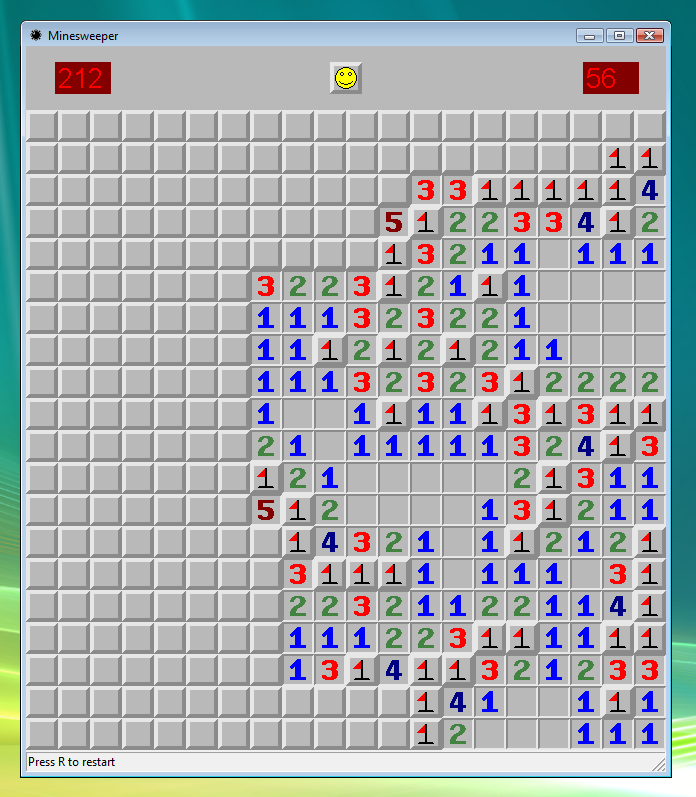 Minesweeper used to not place mines around your mouse, however, it messed up if you moved with your mouse. Now the position is saved first so the game can avoid it even though your cursor isn't there. Added a new tile for the editor: Wall. Has no number value and can't be revealed. Place with right-click. Made sure that levels from v1.1 are still compatible, so you can open them in 1.2 too (hopefully). Lots of bugfixes that I accidentally didn't fix in 1.1. They should reduce the chance of crashing (but probably don't remove it completely). Optimized as much as I could, so the game size increased just by 3 kilobytes (391 kB). Now supports placing question marks (optional). Added editor for making, saving and playing custom levels (because why not?). Place mines by clicking on the map. First version. Seems working fine, but with some bugs, gonna make some updates. I really love minesweeper, so seeing this actually makes me very happy. Bravo. (Edit): It's too bad that every single one of my anti-virus soft-wares YELLED AT ME SAYING "VIRUS DETECTED. VIRUS DETECTED." afaik its because some virus detection programs work by assuming all programs are viruses until they can be uploaded to their servers to be tested more thoroughly, so when you release your own program its likely to be detected for a while until its tested. Yeah I know - it's due to the fact that it's an unknown publisher and my anti-virus softwares don't like small things like that. I still obviously downloaded it and played around on it. Note: It might be a bit annoying to always download a new version. If I find out how to make an Auto Downloader, I'll upload it in version 1.4, but I highly doubt it. You don't need to worry, just do what you feel happy doing. Great work, I'm glad that you are testing things out. Can't wait to see what you do next! I used to use CTF 2.5 for making apps and games, still use it for minor games but for now, I'm trying to learn everything from scratch by using visual studio. That way I can understand everything from the ground up. Nice game btw, loved minesweeper back when it was on XP. Well the engine what I use is theoretically C++ in images, and you learn it faster than actual C++. It's over 20 years old (updates from 1997 to 2012) but it still checks out, so I recommend it. The game engine apparently supports Xbox controllers, although it was created before Xbox even existed. So I added that into Minesweeper too. I also looked at the Minesweeper forum, it was a bit cringy how seriously they take the game, but at least I learned there some new stuff.